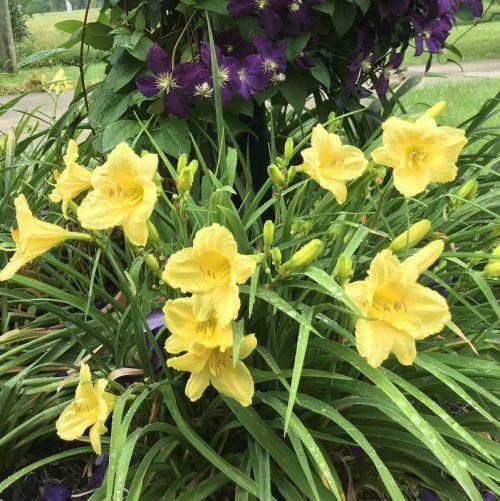 I was looking for a yellow rebloomer when I saw Happy Returns in a friend’s landscape. A beautiful plant with lots of blooms. Ordered seven of them and planted them on June 7th. Here it is June 7th and I got a bloom from one yesterday and I noticed a scape on another this afternoon. In my 50 years of growing daylillies I don’t remember bare rooted plants putting up scapes that quickly. As always my Happy Returns arrived in excellent condition and with big beautiful fans. This is my 3rd order from Oakes and I wouldn’t order from anyone else. 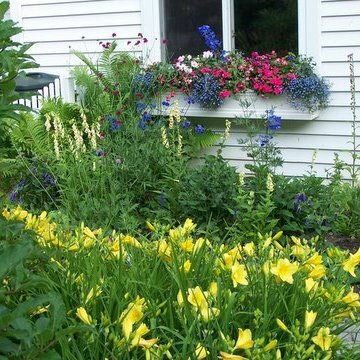 Helpful staff, excellent service, beautiful daylilies. Very pretty bright yellow!! I like it better than Stella , and I have it too ,to compare. 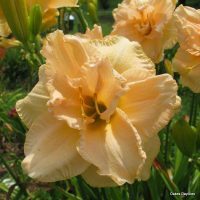 This is the only one of my daylilies that blooms into October here in southern NJ. In fact, the last bloom opened 2 days ago, right before our first hard frost! 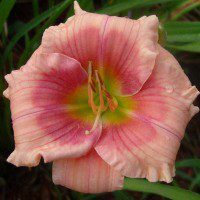 It is so lovely to have at least one daylily cheerfully blooming as the days grow shorter. Not a tall plant, but definitely worth having in your garden, and a bargain price, too. 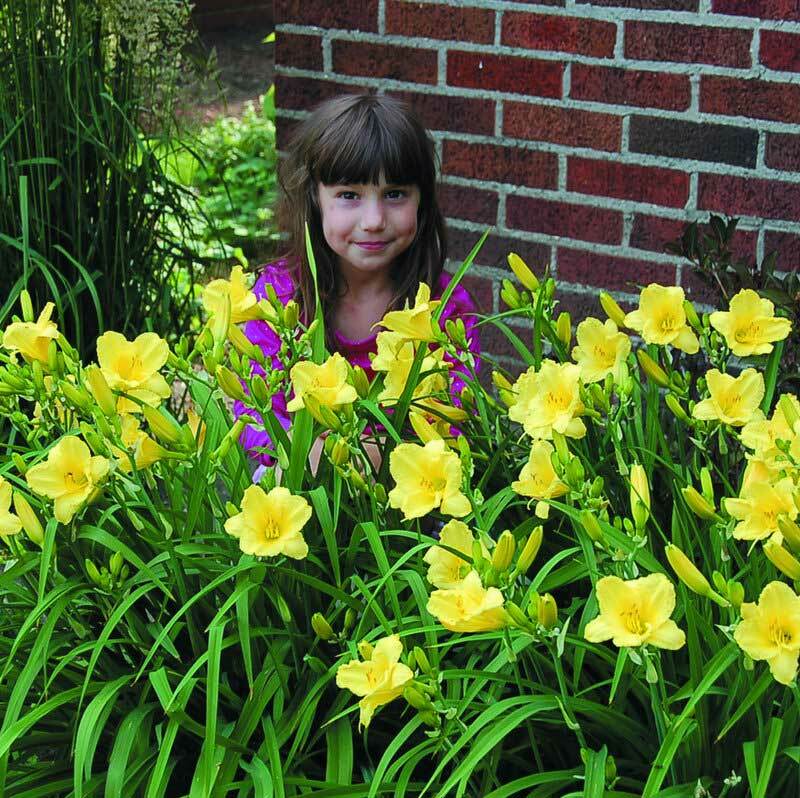 A cheerful lemon yellow flower that blooms more than my other daylilies. If you want consistent color in your landscape this is the one to choose. I have this on the east side of my home, in partial shade and it does very well. I put this in the ground and a month later it was blooming with one scape. Since it is late in the season I don’t expect more for the year but I am very pleased with what I saw. I am bored with Sella. Rule of thumb: if you want “striking color” from a distance, plant colors that are on the lighter side. Deep, dark colors don’t translate as well. Happy Returns is a better show than Stella for a yellow. A true “crayon” yellow, this is my favorite and seems to cause many cars to slow down passing my house as I have MANY of them front and side. Never quits blooming and is needing division yearly after only three years. 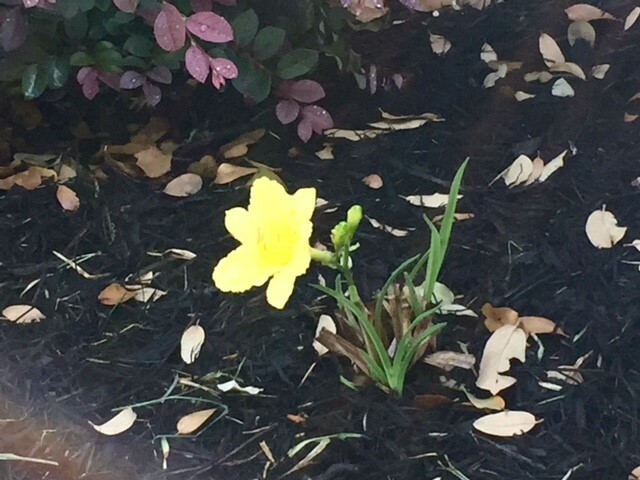 I call this The Little Daylily That Could. It just keeps chugging along, blooming its head off, looking cheerful and beautiful, seemingly forever. Very happy with Happy Returns! 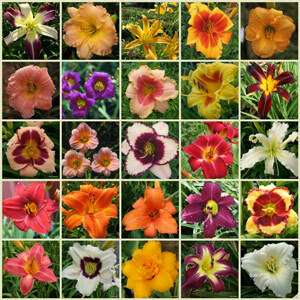 This year I started a mixed border with several each of Happy Returns and Stella D’Oro. HR actually bloomed MORe than the Stella d’Oros, where there would be one bloom on the Stella there would be 3 or 4 on the Happy Returns. And, they started earlier, too, and have kept on going, several blooms every day for months. This is one of the most cheerful plants I’ve ever seen. Every single day your garden will look nice. I’m really glad I picked it. Such cheerful, light blooms! Definitely a good choice for those looking for clear, bright yellows. Very HAPPY looking! Looks great, SMELLS great, and performs great! 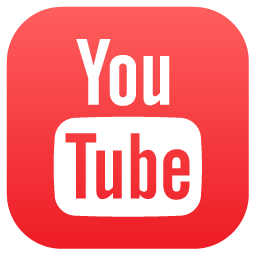 This one is very dependable! This plant is the workhorse of my gardens. I scattered in several places to spread cheer and color throughout the growing season. A beautiful clear sunshine yellow that blends so much better with pinks than Stella de Oro. And it blooms and blooms and blooms! It’s compact size makes it a wonderful edging plant or for the front of the border. This is a wonderful little lily. I planted these along my driveway and than kept my fingers crossed because when they put the pavers in for the sidewalk they filled this area with sand, I added what planting mix I could. They have had beautiful flowers all summer and are still blooming. Stayed lovely even during our heat waves. Couldn’t ask for a better plant. My two ‘happy returns’ are one year old and blooming well this summer. I really like the texture and sparkle of the blooms. It holds its color well and does not fade in the intense afternoon sun. This is a beautiful plant with an extremely clear yellow bloom. I actually had blooms the second week of December! Wonderful! Many blooms and a beautiful clear yellow. It is perfect for any garden. The foliage is also nicely shaped. I have noticed many nurseries carrying this variety now but I would still order from Oakes for a guaranteed healthy plant. This will be the third summer for my Happy Returns. They are in a border bed with ornamental grasses and cannas. They have provided color continously all summer for the past two. In addition, they are wonderfully fragrant – the best of both worlds. The color of Happy Returns cannot be over-rated. It is a clear, true yellow, with no trace of orange or gold. BEAUTIFUL! My specimen is presently being obscured by a Trumpet Vine (campsis radicans) that seems to be on steroids; nevertheless, “Happy” is about to produce a second flush of blooms which looks to be rather prolific. Thank you, Happy Returns. You will soon be in a more-deserving environment! The summer of 2004 was the first blooming season for this perfect plant. It began blooming in early summer and continued til Thanksgiving without interuption. The lovely yellow blooms add constant color and life to my garden. 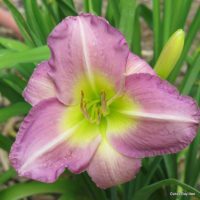 Great daylily! I ordered June 29; received July 9; blooming today . . . beautiful soft yellow flower. Cannot ask for more. Thanks, Oakes for the beautiful, large, healthy plants. 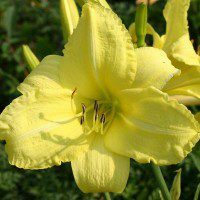 A very cheerful lemon yellow with a light fragrance and delicate ruffled blooms. What’s not to love? It is a good rebloomer too! A great choice! You’ll just love this little one. It’s blooms go on forever. Love the soft lemon color.